The outgoing Mahindra Xylo was a sober looking MPV with decent exterior design that was more practical then a head turner. Mahindra has now redone the outside which is now much trendier looking.The front end of the New Xylo gets a fresh nose job, an all new center grill which has eight vertical slats in glossy black finish with black horizontal slats behind them. The headlights get the all clear lens effect which makes them look neat and give a sharp look to the front of the New Xylo. The headlamps have integrated turn lamps placed on the extreme bottom corners.The New Xylo gets an all new front bumper, the Xylo E9 we drove came with factory fitted fog lamps. The new bumper which is in body color gets a corner extension in black that looks aerodynamic and sporty. The bonnet gets a smooth flow down curve that mates with the grill and also has the New Mahindra Logo on it.Moving to the sides, the older Xylo’s side profile was kind of dull, boxy and lacked any design value. The New Xylo’s side profile changes all that, the wheel arches get the up market like wheel arches extensions made of black fiber material. A chrome/black door garnish runs across on the lower part of the doors. The door handles are in neat body colors and gives an up market feel when you operate them. You also get an all black foot board in matt finish on the New Xylo that adds a certain sporty rugged feel to the side profile. The wing mirrors get a new shape on the New Xylo and are in dual color ie body color with black underlays.The tyre profile for the New Mahindra Xylo is Bridgestone Dueler 215/75R15 spec. The most prominent revamp on the side profile of the New Mahindra Xylo apart from the black footboard is the blacked out window frames. The blacked out effect on the sides makes the side profile looks sleek and stylishAt the rear the New Mahindra Xylo gets a new pair of tail lamps with the clear lens effect. A new sharp looking rear spoiler with integrated stop lamp is a very welcome inclusion.The E9 New Xylo also gets a rear wash wipe with rear defogger and blacked out C pillars. The rear bumper gets a pair of reflectors that are now in larger size along with the rear parking sensors and rear foot board. The New Mahindra Xylo E9 also gets a stylish matt black roof trail that adds the extra style and design value.The paint quality has an upmarket air, the weld and body panel joints are also neatly done. 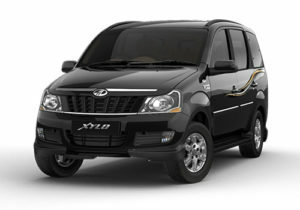 The New Mahindra Xylo is a big improvement as compared to the older Mahindra Xylo in terms of quality on the outside. The Indian market also has a certain soft spot for beige interiors. Although the Xylo already came with a beige interior with a wood lookalike inlay in the dashboard and on the centre console, the new Xylo has been updated to look more premium that ever before. For starters, the plastic panels have now been updated and come in a shade of black as opposed to the generic brown one offered earlier. Not only does this make the interior of the Xylo look more mature and luxurious than ever before, it has also helped decrease to overall clutter on the inside. The Mahindra Xylo has always been quite spacious and the new one continues that trend. The driver now gets a height adjustable seat that highly improves the driving position and comfort. The Xylo is available in a combination of seating configurations, with the entry level variants getting a bench seat setup. The higher H8 and H9 variants get a captain seat configuration centre row. The first and second row of seats also comes with a set of flip down hand rests that helps with the added comfort. The Xylo also gets a new perforated seat fabric that is much softer that before and also adds to the overall appeal to the spacious Xylo. The top of the line H9 version also gets leather interiors. Mahindra cars in recent times have been quite heavily crammed with technology that equipment. Similarly, the Xylo comes with a long equipment list on the top of the line H9 model. The biggest addition to the new Xylo is cruise control. Apart from that, the Xylo also now comes with follow-me-home headlamps. Other features such as a Bluetooth enabled infotainment system has changed pretty much unchanged. The Xylo also comes with other features such as electronically adjustable ORVMs but still lacks climate control. The Xylo still retains the 2.5-litre engine as before which produces 114PS@3800rpm and 260Nm of torque between 1800 to 3000rpm. Power delivery on both the engines is linear and the Xylo can reach speeds of up to 160kmph. The 2.5-litre engine reaches 100kmph in under 16seconds which are faster than the Toyota Innova. When pushed, the engine, however, doesn’t feel as smooth as on the Innova. Another engine option is the less powerful mDI CRDe engine which produces 95PS and 220Nm of torque. Exclusive to the E9 variant is the mHawk engine sourced from the Scorpio. The 2.2-litre common rail engine produces 120PS and this engine comes mated to a new 5MT320 gearbox.As of Ride quality, the Xylo MPV uses a body-on-chassis architecture with independent double wishbone suspension at the front and multi-link suspension with coil springs at the rear. No changes have been made to the suspension and Mahindra hasn’t even added an anti-roll bar. The manufacturer, however, claims to have tweaked the suspension but the setting remains soft and the Xylo still exhibits a lot of body roll. The Xylo MPV uses a body-on-chassis architecture with independent double wishbone suspension at the front and multi-link suspension with coil springs at the rear. No changes have been made to the suspension and Mahindra hasn’t even added an anti-roll bar. The manufacturer however claims to have tweaked the suspension but the setting remains soft and the Xylo still exhibits a lot of body roll. The slow speed ride quality remains good but as you go faster the skyscraper stance and heavy front end responds poorly to cornering and hard braking. Just like other Mahindra car models, the MUV is equipped with several safety features such as central locking system, side impact bars, child safety rear door locks, crumple zones, door open warning, keyless entry, rear defogger, engine immobilizer etc. ABS (anti-lock braking system) with EBD (electronic brake-force distribution), Intellipark reverse assist and dual airbags are available only with the top-end model.